The decor of the cafe has a main color scheme of black, which, besides being a slimming color, is a classy colour. But the bare no-table cloth and the casual setting signal the cafe to market itself as a mid-range cafe. For lunch, I ordered the wagyu ribeye ($28) and added $3 to make it into a set, including a starter (salad or soup) and tea/coffee. Strange there is no dessert in the set. Even stranger is that when I wanted to substitute the tea/coffee to a soft drink, I had to pay $1 more. Isn’t it easier to provide soft drinks than to make a beverage? Shouldn’t it be cheaper? In total, I paid $38, quite a hefty sum for lunch at a mid-range cafe. For the same amount of money, I could have eaten a heavy meal at a much classier restaurant. The pricing is my main complaint because the food is truly amazing. After eating the food, I was in such a good mood that I didn’t mind paying the money. 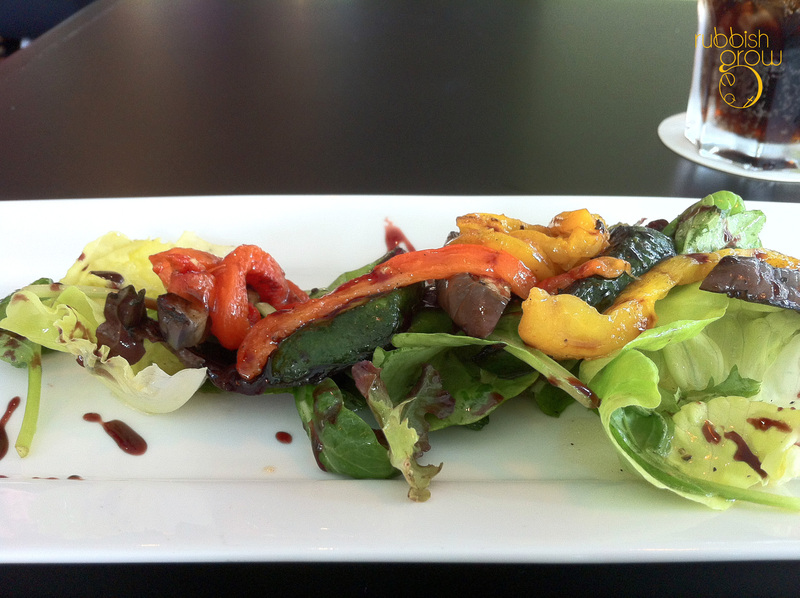 The salad has a surprising hot stir-fried eggplant and bell pepper in a sweet vinaigrette sauce, making it very warming for the tummy. Yummy. Although both the salad and the wagyu ribeye are a tad oily–look at the oil oozing out of the wagyu–the tender beef is perfect, very tasty, savory, buttery. When beef is cooked rightly, it actually tastes similar to char siew, and this is how tasty the wagyu is. One of the best steaks I’ve eaten. Even the mash is one of the best mash I have, even as good as Salt’s. The vegetables are done admirably too that I, who don’t usually like vegetables, devoured them all. The two dishes are just marvelous. After eating, I felt so ridiculously happy. That’s what good food can do to your mood. Service: An untrained waitress served me but she got the moves like Jagger, i.e., she knew all the right moves to make. When I asked a question she couldn’t answer, she went to ask the manager. Kudos to that. Verdict: The food is fantastic at this unassuming cafe but the pricing could be adjusted to suit the decor. PS: Although the steak is costly for a mid-range restaurant, we classify the place as “good and cheap steak” because the steak is considered affordable when compared to other restaurants where a good steak can cost up to $80-$100. 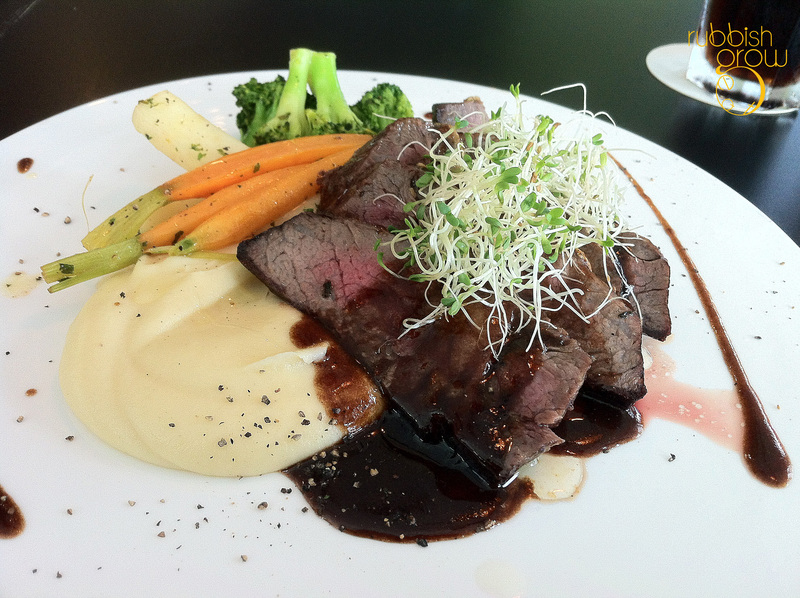 One more bonus: It’s a New Zealand cafe – probably the only one in Singapore. AND – they sell Wellington’s best coffee, “Havana” – possibly the best beans available in Singapore apart from those roasted fresh here at Lam Yeo. And willingly I paid. It put me in a really good mood after eating. I’ve sort of sworn off having steak at restaurant, after figuring out where to get cheap wagyu (Culina’s, and not the best cut or marbling, of course) and some tricks to grilling steak…. As good as Le Bistro du Sommelier, and at half the price. I sworn off steaks too after knowing how cheap steaks are! There is a place to get very steak, QB food trading. 2kg of grass fed tenderloin for $23 or something. Been here about 3 times.. I must say it is really good! Ham and cheese abit too “gelat” but I was already a happy man after having the risotto. Left a note on the table, it should have made their day. You make me want to return to the place. I will go back soon! im actually cardboardlights, changed my profile for certain reasons..
realised its actually mac and cheese and instead of ham.. my bad..
went back today and tried their eggs benny.. what caught my attention instead was the salad accompanying the dish.. I swore i almost asked more more veges! its quite rare to find a place that serves brunch all the way till 6 like Blackbird (only on weekends though).. Good for people who cant wake up too early..